Give our beautiful Crystal Heart Flower in Basket to your mother to let her know how special she is to you. A mother is one of the most selfless people in the world. She always puts her children’s needs and wants before her own. A mother plays many roles throughout the day, she’s a nurse, chef, maid, ref and most importantly she’s a mom. She’s there to kiss your boo-boos and wipe away your tears. 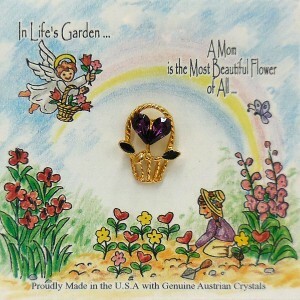 Let your mom know how much you appreciate her and all that she does with our Crystal Heart Flower in Basket pin. Remember, a mom is the most beautiful flower of all. Our Crystal Heart Flower in Basket features a woven basket layered in a 14Kt gold finish with a Genuine Austrian Crystal heart shaped flower inside. 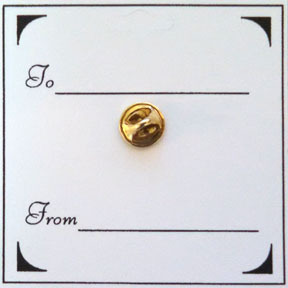 Each pin comes on a colorful greeting card which has a thoughtful message and a “To and From” on the back giving the ability to sign and address this special gift for that special someone.